Alpha One, Wakefield Charity Game in Support of The Pilgrim Bandits. On the 3rd of May I was invited to attend the Alpha One Yorkshire VS. Lancashire Charity Game that takes place every year in support of The Pilgrim Bandits - a great charity set up by Special Forces Veterans that supports injured service personnel (http://pilgrimbandits.org/) by one of my followers on Instagram @taskforcewarrior so myself and 3 of my team mates from Grey Fox made the drive to Yorkshire. 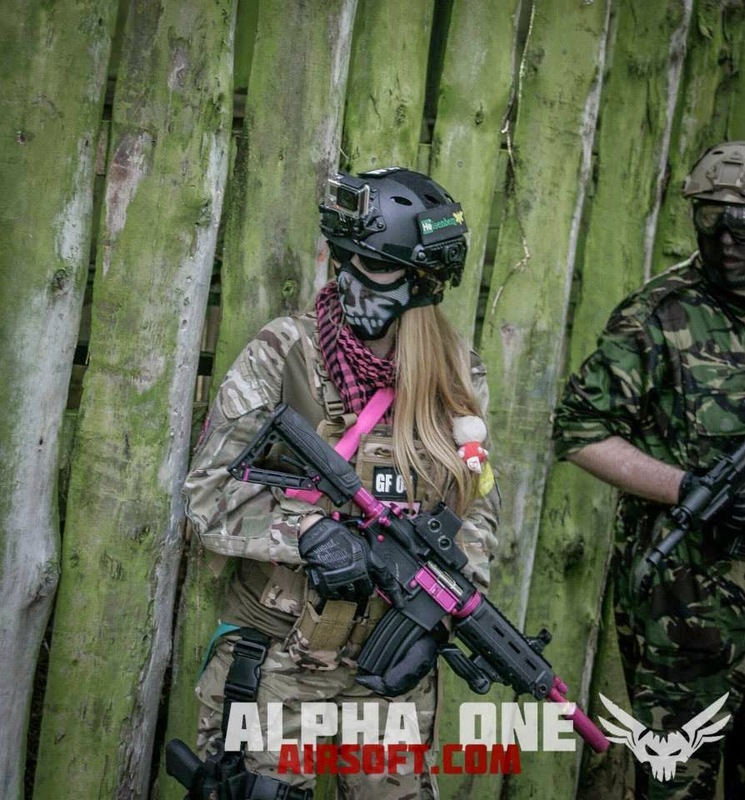 The game took place at Alpha One in Wakefield, Yorkshire - around a 2 hour drive north of my hometown in Derbyshire. The drive was very easy - straight up the A38 and then the M1, the site is very close to the exit on the M1 as well, it is the easiest drive I have ever had to a site which is always a bonus! It is signposted which is always very helpful. The site boasts a large car park but on the day of the charity event, with hundreds of players, it became full, very fast – I was however directed to a suitable place to park on the side of the road by the on site marshals. Booking on took place on the Alpha One website and payment was made at the same time via PayPal which is always incredibly quick and simple! The price for the Charity Game was £30 walk on and included a hog roast lunch! When we arrived at Alpha One, we were greeted by the sites Marshals and confirmed our places with the staff on the reception. 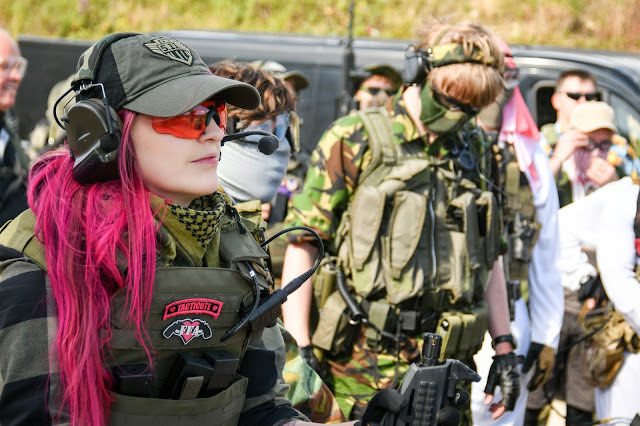 The safe zone was a large cluster of sheltered booths set around a clearing which was easily large enough to accommodate the amount of players on the day however, the booths were quite crowded when you consider how much gear the average Airsofter takes to a game! The safe zone had a small shop that stocked all the beebs, gas and pyros that you would need for the day, and just outside was a small pop up shop selling RIFS and the Pilgrim Bandits stand where you could buy merchandise to support the charity. Chrono was performed in a purpose built target area just outside of the safe zone, using 0.2g BBs. The site limits are 350 FPS for AEGs, 400 for DMRs and 500 for Sniper Rifles with a 25 metre minimum engagement distance. Chrono was performed by the sites marshals who were professional on the day, helpful and had a great sense of humour. 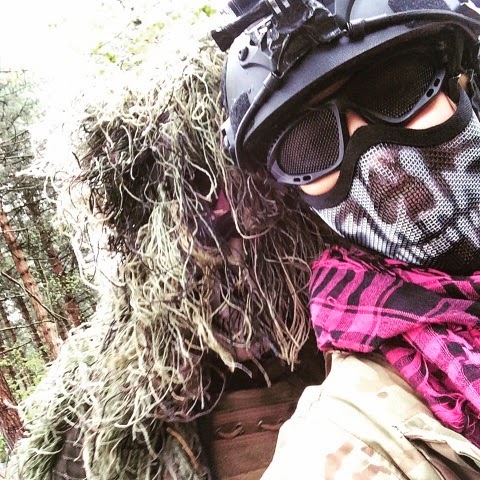 One of the things that I really liked about Alpha One was that their female Marshals Kirsty and Juju were appointed as the two team leaders - I really love seeing women in leadership positions on the Airsoft field! The Alpha One site itself is quite impressive, it is 110 acres of woodland with many different structures built to enhance gameplay. I'm not sure of the average game day numbers but at the charity event, there was at least 170 player spaces on the booking form, which makes for fast paced, intense game play. 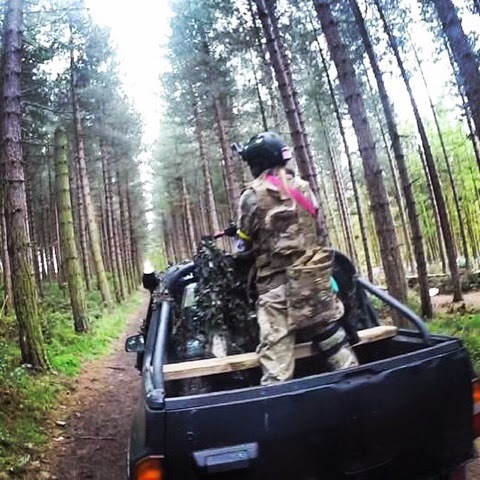 The woodland itself is a natural wood so it has gulleys and steep hills that are great for firefights and in between these natural formations are a CQB castle used for attack and defend games, a Star Gate (which has to be the most weird and wonderful prop I've seen at an airsoft site!) and other built up pieces of cover. My favourite was definitely the Star Gate, however, the simplicity of towers and pipes placed around the site you can climb up and in really does appeal to me haha. The games were ran well, with clear and concise safety briefings which players adhered to, one of the difficult things about a woodland site in the wind and rain with the distances involved is gauging whether you have actually hit a player, so there were a few incidences of cheat calling however they were dealt with swiftly and professionally by the Marshals. Remember, if in doubt, ask a marshal! 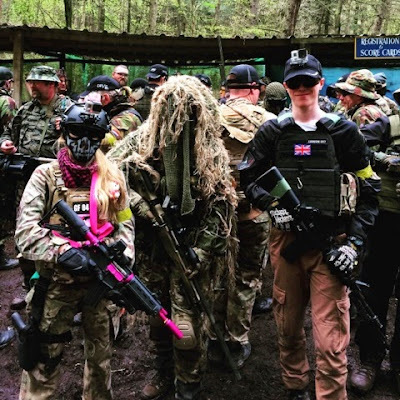 One thing I loved about the site was how friendly the other players were, I had the pleasure to meet fair few of my Instagram followers which is always a great including @taskforcewarrior and @luke_tw! There was a great atmosphere in the safe zone when we returned from a game, that was full of camaraderie and banter. The mix of players included experienced and newbies which I think always makes for interesting game play! Later in the evening there was a chance to listen to a talk by ex SAS Rusty Firmin and a National Hero Ben Parkinson at the site over a free bar which unfortunately I couldn't make but from what I heard from my team members was it was an interesting and informative talk! If I didn't have work, I definitely would have stayed for the duration of the evening. Overall the event raised £1500 in cash on the day and there's even more coming in! Which is fantastic! It was a fab day all round with great food, laughs and even a raffle. I would definitely like to return to Alpha One for a regular game day to compare the two! (First two photographs thanks to the on site photographers!) 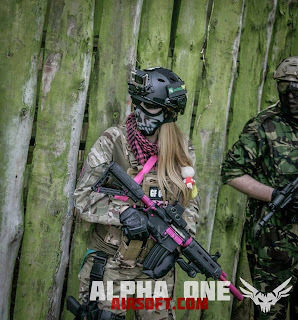 Check them out at www.alphaoneairsoft.com!